MARTINSVILLE, Va. – Tempers always flare at Martinsville Speedway; it’s a well-defined by-product of short-track racing and Sunday’s First Data 500 was no exception. Shortly after the checkered flag waved third-place finisher Martin Truex Jr. vowed race winner Joey Logano wouldn’t be the 2018 champion. Winning team owner Roger Penske’s anger at Truex’s remarks was evident. And Logano said he didn’t want to crash Truex, but he wanted to win. After all, the winner of the Logano-Truex duel punched his team’s ticket to Homestead and a berth in the Championship Four. Now, for the third time in five years, Logano finds himself in the title battle. For most of the afternoon, the First Data 500 was basically a ho-hum race as Logano led four times for 309 of the 500 laps and Kyle Busch led twice for 100 laps. Then with seven laps remaining the race exploded with emotional intensity. That’s when Truex moved to the inside of Logano and for the next three laps they dueled side by side. Truex then briefly fell behind Logano before pulling back to the inside with three laps remaining. When the two cars took the white flag, Truex was leading Logano. They raced down the backstretch at NASCAR’s shortest track and as they headed into turn three, Logano bumped Truex, moving him slightly up the track. Logano scooted his Ford under Truex’s Toyota to exit the final turn side by side. They banged sheet metal, Truex slipped sideways and as he fought to regain control Logano fishtailed to the finish line while Denny Hamlin snuck to the inside to claim second. Logano said his sole intent was to win the race, not wreck Truex. 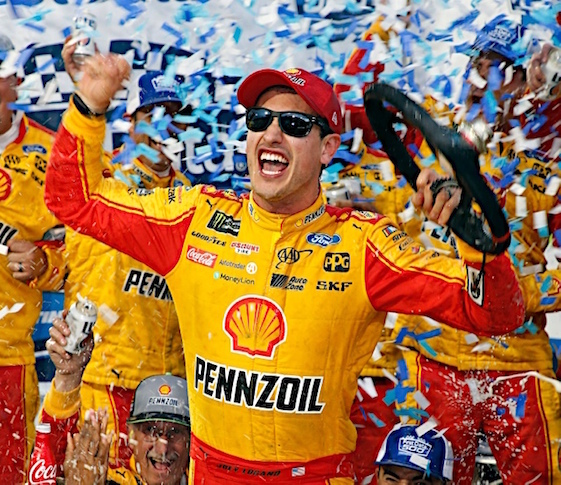 (10) Joey Logano (P), Ford, 500. (3) Denny Hamlin, Toyota, 500. (33) Martin Truex Jr. (P), Toyota, 500. (1) Kyle Busch (P), Toyota, 500. (7) Brad Keselowski, Ford, 500. (6) Kurt Busch (P), Ford, 500. (19) Chase Elliott (P), Chevrolet, 500. (16) Ryan Newman, Chevrolet, 500. (8) Daniel Suarez, Toyota, 500. (12) Kevin Harvick (P), Ford, 500. (5) Aric Almirola (P), Ford, 500. (34) Jimmie Johnson, Chevrolet, 500. (13) Chris Buescher, Chevrolet, 500. (15) AJ Allmendinger, Chevrolet, 500. (23) Ty Dillon, Chevrolet, 500. (17) Jamie McMurray, Chevrolet, 500. (14) Alex Bowman, Chevrolet, 500. (36) David Ragan, Ford, 500. (18) Ricky Stenhouse Jr., Ford, 500. (4) Ryan Blaney, Ford, 500. (2) Clint Bowyer (P), Ford, 499. (35) Paul Menard, Ford, 499. (24) Matt Kenseth, Ford, 499. (28) Cole Whitt, Chevrolet, 498. (20) Michael McDowell, Ford, 497. (21) Erik Jones, Toyota, 494. (29) DJ Kennington(i), Toyota, 493. (27) Regan Smith, Chevrolet, 492. (22) Ross Chastain(i), Chevrolet, 492. (25) Austin Dillon, Chevrolet, 491. (38) JJ Yeley(i), Toyota, 491. (32) Landon Cassill(i), Chevrolet, 490. (39) Jeb Burton(i), Chevrolet, 489. (37) Bubba Wallace #, Chevrolet, 488. (30) Joey Gase(i), Chevrolet, 467. (26) Matt DiBenedetto, Ford, 451. (9) Kyle Larson, Chevrolet, Engine, 393. (40) Timmy Hill(i), Toyota, Engine, 368. (11) William Byron #, Chevrolet, Accident, 364. (31) Hermie Sadler III, Chevrolet, Brakes, 230. Average Speed of Race Winner: 75.31 mph. Time of Race: 3 Hrs, 29 Mins, 32 Secs. Margin of Victory: 0.107 Seconds. Caution Flags: 8 for 68 laps. Lead Changes: 11 among 6 drivers. Lap Leaders: K. Busch (P) 1-30;D. Hamlin 31-44;C. Bowyer (P) 45;K. Busch (P) 46-115;D. Hamlin 116-132;J. Logano (P) 133-359;M. Truex Jr. (P) 360-376;J. Logano (P) 377-418;B. Keselowski 419-459;J. Logano (P) 460-498;M. Truex Jr. (P) 499;J. Logano (P) 500. Leaders Summary (Driver, Times Lead, Laps Led): Joey Logano (P) 4 times for 309 laps; Kyle Busch (P) 2 times for 100 laps; Brad Keselowski 1 time for 41 laps; Denny Hamlin 2 times for 31 laps; Martin Truex Jr. (P) 2 times for 18 laps; Clint Bowyer (P) 1 time for 1 lap.